Neil Scott from Mammoth Lakes, California topped the field of a $365 buy-in event at Planet Hollywood in Las Vegas, which currently hosts a stop on the 2017/2018 WSOP Circuit schedule. 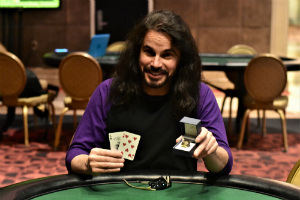 The player scooped $12,798 and his first-ever gold ring after almost a decade of WSOP Circuit grinding and 62 in-the-money finishes in the series. Scott outlasted a field of 158 fellow contenders to capture the coveted piece. Of his accomplishment, the player said that it was all surreal to him. He went on to say that he was particularly happy to celebrate his triumph with his friends. The player actually had quite some support from the rail, with some of his best friends being at the host venue to lift his spirits throughout the event. Including his latest cash, Scott now has more than $216,323 in earnings from the WSOP Circuit. He also has two WSOP in-the-money finishes one of which from this summer, but the WSOP Circuit has clearly been his main focus over the years. As mentioned above, Scott was one of 158 entries who registered for the $365 No-Limit Hold’em tournament. The event was played over two days. It generated a prize pool of $47,400. The top 18 finishers left with a payout for their deep run into the game. The second and final day of the tournament kicked off with 13 survivors and with Richard Wysocki as the chip leader. The player had 387,000 in chips at that point. Scott was second in chips with 240,000. Lowell Kim rounded out the top three chip counts with a total of 220,000. After several hours of play, the start-of-the-day field was reduced to Scott and his heads-up opponent Christopher Perkins, who was too vying for his first WSOP Circuit gold ring. 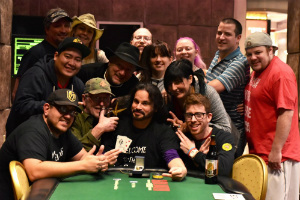 The coveted gold piece was Scotts’ to win and it was not long before the player emerged victorious and was ready to pose for a happy picture surrounded by his many supporters from the rail. The player, who sported shoulder-length locks, said that he would eventually cut his hair and donate it to a cancer charity that works with children who have been diagnosed with the terrible disease. Growing long hair was part of a bet he made with fellow poker players a couple of years ago. They agreed to leave their hair grow until they won a piece of WSOP Circuit jewelry. Scott actually revealed that he was the only who kept to his promise.